of his first book and support a local charity all at the same time. A Doctor’s Journey: An emotional and humourous look at life through the eyes of a doctor, is Bharwani’s first book and was released two weeks ago. 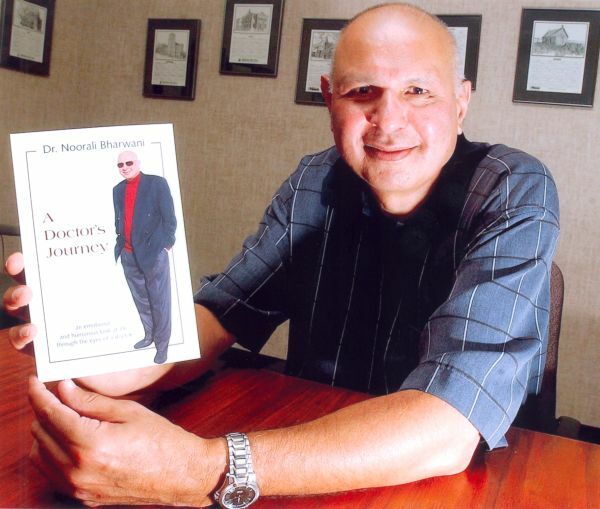 On Thursday, Bharwani is hosting a book party at the Medicine Hat College courtyard from 6 p.m. to 9 p.m. The evening will include a book signing and refreshments. Twenty-five per cent of the proceeds from the book sale that evening will be donated to the Medicine Hat News Santa Claus Fund. Bharwani has been writing a medical column for The News for approximately nine years. The book includes several of Bharwani’s newspaper columns, however many of them have been updated or revised, he noted. The self-published book includes 28 chapters on various subjects, such as his childhood and writing for The News. One of Bharwani’s favourite chapters is the one where he talks about his mother and father. Bharwani said the response to his book since its release has been good. Bharwani has plans to start on his second book after Christmas once he has finish promoting A Doctor’s Journey. A Doctor’s Journey is $18 and can be purchased at various locations around the city, including the Medicine Hat News office on Dunmore Road.